Electro-thermodynamics provides a consistent framework to derive continuum models for electrochemical systems. For the application to a specific experimental system, the general model must be equipped with two additional ingredients: a free energy model to calculate the chemical potentials and a kinetic model for the kinetic coefficients. 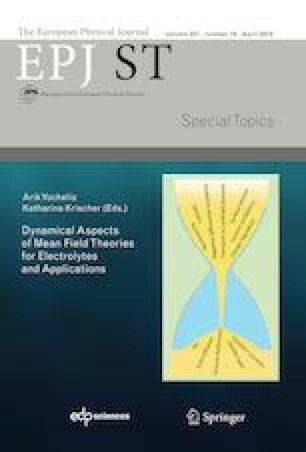 Suitable free energy models for liquid electrolytes incorporating ion–solvent interaction, finite ion sizes and solvation already exist and have been validated against experimental measurements. In this work, we focus on the modeling of the mobility coefficients based on Maxwell–Stefan setting and incorporate them into the general electro-thermodynamic framework. Moreover, we discuss the impact of model parameter on conductivity, transference numbers and salt diffusion coefficient. In particular, the focus is set on the solvation of ions and incomplete dissociation of a non-dilute electrolyte.